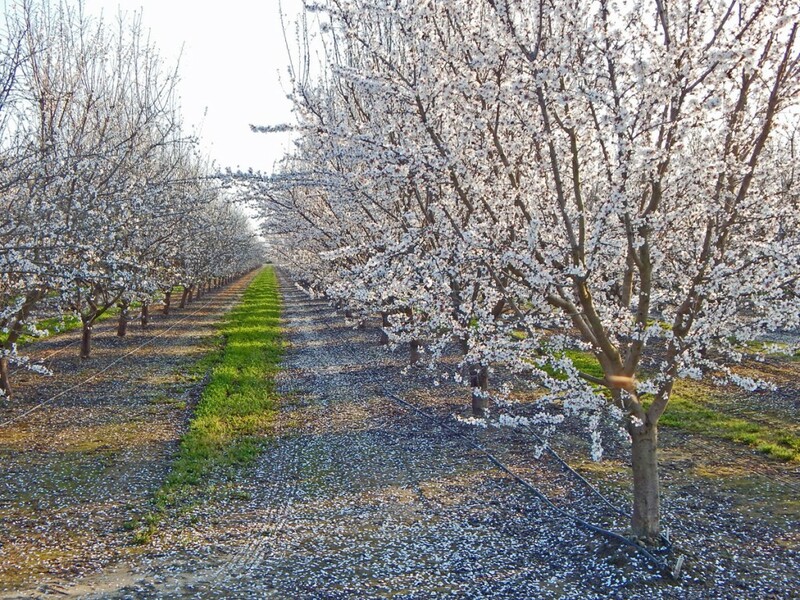 The almond bloom is blanketing California’s orchards in white. Despite the challenges posed by water during the bloom the clear and moderate weather is a blessing for the almond industry. Throughout the Central Valley, growers have reported strong bee activity, lasting anywhere from seven to nine pollinating hours a day. The bloom ranges from near peak to just past the peak and is exhibiting textbook timing and overlap between varieties within different plantings. In the north, the Nonpariel and its associated pollenizers are at peak bloom. The central region reports that later blooming varieties such as Carmel are progressing quickly toward their peak and are continuing to be timed well with the Nonpariel. Growers in the south have reported that Nonpariel is overlapping well with many Sonora plantings and California type pollenizers. Meanwhile, with the rapid progression of the bloom period and weather forecasts suggesting another dry week, growers with water availability are starting to irrigate. Given ideal conditions, I will be posting less frequently on this bloom. For those seeking daily information, Blue Diamond’s Bloom Report is an invaluable tool. Updated each morning during this period, the reports are broken down by region and offer targeted insight from Blue Diamond’s knowledgeable field supervisors.